Site and development news straight from the Camel Farm. Things are still a bit funky, but site is back online! September 18, 2015 at 10:11 PM. We will write a full blog post about the server move later on, but for now we have some news to share. The move went well! No major issues, just the usual configuration aches and pains that come with the territory... That being said, we will not be updating any products until tomorrow morning, to ensure that things don't crash overnight. We've been up at 4am and in bed at midnight for two days straight, so we are ready for some good sleep. Tomorrow morning (September 19, 2015 Pacific) we will turn product updates back on. That is the final piece of our infrastructure that remains offline. Thank you for your patience; we hope this move will put us in a very reliable place for the upcoming holiday shopping season. Our site will be down on Friday, September 18th. September 16, 2015 at 8:35 PM. On the morning (PST) of Friday, September 18th, 2015, we will be moving our servers to a new datacenter. With backups, securely loading the servers into vehicles, driving the three hours to the new datacenter, unloading, and installing and configuring the servers, we expect this will take most of the day. Fortunately, Friday is the slowest day of the week here at the Camel Farm, so this hopefully won't be too big an inconvenience. We will be posting updates to the homepage as the move progresses. Please join us in the crossing of fingers, and hope for the best! September 14, 2015 at 9:25 AM. We launched a tiny but handy new feature yesterday. Camelet is a bookmarklet that brings you from an Amazon product page to the camelcamelcamel product page with one click. Even though we already have an extension (the camelizer) that allows similar functionality, we thought this bookmarklet might be easier to install and use for some people. In fact, install and use can be illustrated by one animated gif. You just drag some camels to your browser’s bookmark bar and then it’s installed. Then whenever you’re on an Amazon product page you can click those camels to get to camelcamelcamel’s product page for that item. In addition, there’s a nifty feature that injects 3 little camel icons into pages you’re viewing that link to Amazon like so. So if you’re on a non-Amazon site that mentions an Amazon product and links to it, we’ll create some direct links to camelcamelcamel product pages for you. If you click the bookmarklet again (or on any other page) it just acts like a regular bookmark and takes you to camelcamelcamel’s homepage. So check out camelet and connect to camelcamelcamel faster. August 14, 2014 at 1:12 PM. We’ve just launched two new features this morning. Many of you have requested we support Smile: Amazon’s new charitable contribution option for purchases through Amazon US. With Smile you can choose a charitable organization to give 0.5% of the price of your (eligible) Amazon US purchase to. In order for the contribution to happen though you need to check out through smile.amazon.com. 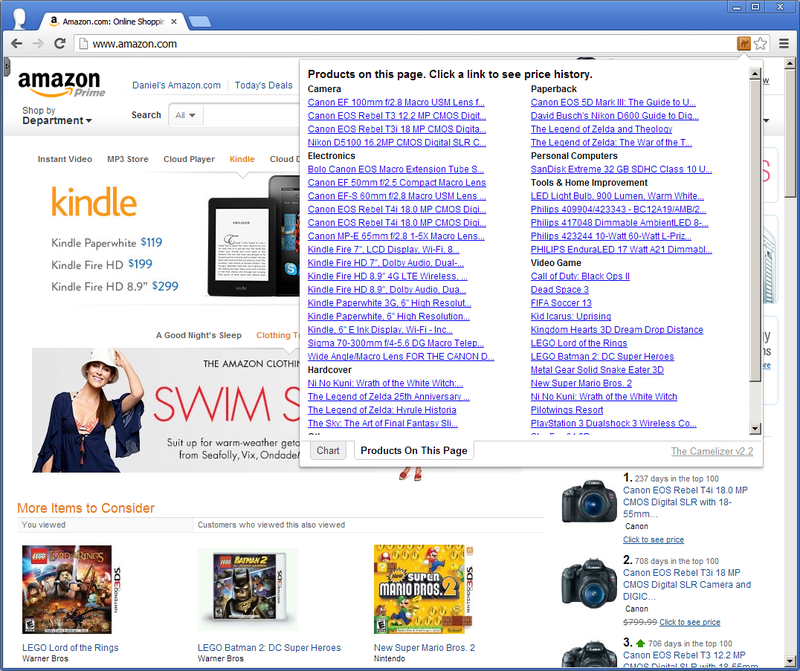 Our new Smile feature directs all of your links to Amazon’s Smile site if you choose to enable it. The feature is available to logged in camelcamelcamel users on your account settings page. The second feature we’ve launched is a simplified price watch form. We’ve (optionally) hidden some of the lesser used fields in the watch form design. The watch form now simply asks for your desired price on a product/price-type combo (i.e. Amazon, 3rd Party etc…). You can switch to the detailed form whenever you like to see the optional fields (like label and Twitter notification) by using the buttons at the bottom right of any price watch page. Email and Twitter settings for watches will default to your account settings again listed on the account settings page. Camelizer for Chrome: Back in the Chrome Store! April 12, 2014 at 11:15 AM. April 9, 2014 at 10:57 AM. Google removed The Camelizer from its extension gallery yesterday without notifying us as to why. We have contacted them and resubmitted the extension for approval, but nothing has changed yet. We hope it was a simple misunderstanding and that our extension will be back to its former glory soon. In the meantime, we are very sorry for the inconvenience this is causing everyone who is trying to install it. February 19, 2014 at 12:06 PM. Although Apple has apparently decided we’re not worth including in their Safari extensions gallery, we have kept The Camelizer for Safari up-to-date with its Chrome and Firefox siblings, and have just updated our site with the latest version. Grab The Camelizer v2.4.4 for Safari here! The Camelizer Now Works with Firefox 27! February 13, 2014 at 1:14 PM. Mozilla pushed our latest Camelizer update into their gallery last night. This update resolves the incompatibility issues between the extension and Firefox 27. Please let us know if you continue experiencing problems with FF27 after upgrading the Camelizer. January 13, 2014 at 12:01 PM. Overnight, we had a software glitch that resulted in each price drop alert being sent three times. As of about noon Pacific time, this issue has been resolved. Sorry to annoy you! The Camels Will Be Down For Maintenance Tonight! November 12, 2013 at 12:31 PM. All Camel sites and browser extensions will be offline for a couple of hours on Monday, November 18th, as we improve the power / UPS situation in our datacenter. Sorry for the inconvenience but this maintenance is very necessary! October 21, 2013 at 8:58 AM. We have some major upgrades to perform on our servers and code, and have chosen to do so on the (Pacific time) evening of Friday, October 25th. Thank you for your continued support! We will see you on the other side. The Camelizer v2.3.1 for Firefox is Out! August 29, 2013 at 12:21 PM. 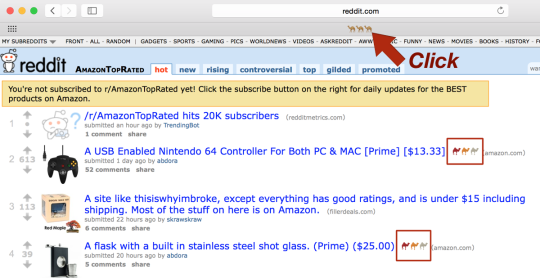 Mozilla finally reviewed the newest version of our Firefox addon, the Camelizer. It brings to Firefox the same features its Chrome sibling has had for a while (the ability to create price watches from within the extension, being a major one) and also addresses the complaints many users had about the user interface of v2.2. Users can now choose which style of UI they prefer, via the addon’s setting page within Firefox. Download The Camelizer v2.3.1 here! And please leave us a review so we know what you think, and can continue improving our addon. August 29, 2013 at 12:18 PM. Cameler Lee spent a lot of time over the last couple of months upgrading every single page on our site to support internationalization. As a result, we’re proud to launch our first site-wide translation: Camels in Spanish! To change your default language, simply click the link at the bottom of any page on our site. We plan on adding more – like French, Italian, Germany, etc – soon, and are excited to provide the site in many of our users’ native languages. Twitter Alerts Are Working Again! June 26, 2013 at 4:37 PM. Apparently, Twitter deactivated the version of its API which we were using to send price drop alerts via tweets. It took us about two weeks, and some user complaints, to figure this out, but we just launched a fix and tweets are again being delivered. Our sincere thanks to the users who emailed us about this problem! We very much appreciate when people take the time to let us know when something is broken. June 13, 2013 at 7:25 PM. Our friend Joshua Teitelbaum wrote a Camelizer toolbar for IE users, who surely must have felt left out of all the Camelizer fun happening in Chrome and Firefox. It adds a Camel search box to your browser which will be automatically populated with Amazon product URLs as you view them, making it easy to jump over to our site and create price watches and/or check price histories. Download it here! Please remember: this is an early release, and may be buggy. It has been virus scanned immediately before upload, and should be considered safe to install, but we recommend scanning it yourself before installing since it’s an EXE file. Please send all bug reports to dan@shup.com. Huge thanks to Josh for putting in the effort of writing this thing. The Camelizer v2.3 for Chrome is Out! June 6, 2013 at 9:55 PM. We just launched a new version of our browser extension, The Camelizer, for Google Chrome, and the update dramatically expands its features. Price watch creation and editing, and wishlist importing, is now built-in! You can do these things from within the extension; there’s no longer a need to go to our site to track products or import your wishlists. All price watches created by registered users will show up in their account on our site. And, as our site has allowed since it was launched, The Camelizer also allows people without Camel accounts to create price watches. Just put in your email address and we’ll alert you when the price drops. Thanks to our newest team member, Lee, who has only been with us six months but is making a massive, positive contribution to the Camels, and is the one responsible for this excellent new version of The Camelizer! Download The Camelizer v2.3 here if you don’t have it, otherwise Chrome will update the extension automatically. May 7, 2013 at 7:54 AM. Since Newegg kicked us out of their affiliate program, we’ve had to find new ways to obtain their data. This means we are currently unable update existing products, add new products to our database, and send Newegg-related email alerts. Newegg just cut off the last method we found, so now we’ve got to beg our users for help. If you’re an affiliate of Newegg and would like to help us out, please email Dan (http://camelcamelcamel.com/contact). All you have to do is export a Newegg data feed for us; we don’t need access to your affiliate account or anything like that. Thanks! Hopefully someone will save Camelegg from death soon. April 23, 2013 at 10:39 AM. Google recently updated their system, and that broke our login code. We’ve just launched an update that should allow our users to login with their Google account again. March 30, 2013 at 8:39 PM. March 6, 2013 at 1:15 PM. Our recent network upgrade broke our support forums. They are now back online! We apologize for the inconvenience caused to those users who tried to access them during the outage, and appreciate those who reported the problem via email! February 27, 2013 at 1:45 PM. Another stealthy update found its was onto the site today. We added carousels to all of the row-style products layouts (like what you see on the homepage). Now when there are more products to display beyond 5 you can click on the right arrow and reveal more. It’s a tiny enhancement, but we think it helps with navigation. February 4, 2013 at 1:51 PM. People love using the top drop filters on the homepage, so we decided to add them to the popular list on the homepage as well. Browse the latest Amazon deals by category without suffering the agonies of an additional page view. Of course, on the homepage you can only see 5 popular products at a time. The full on popular page is still the place to go for the firehose that is Amazon popular deals. January 30, 2013 at 2:13 PM. We’ve just released a new version of The Camelizer, our price tracking browser extension for Google Chrome, Mozilla Firefox, and Apple Safari. Here are the highlights of the changes we made. This is a big release for Firefox users, as we’ve completely redesigned the extension’s user interface to match that of our Chrome extension. The result? No more “add-on bar” buttons to deal with, no more huge Camelizer display at the bottom of your Firefox window, and no more memory leaks (we hope). Previous versions of The Camelizer only worked on product detail pages on retailer sites; that is, the Camel icon would only appear if the user was browsing a product page. This has changed with v2.2, as The Camelizer now detects all products in retailer pages and displays a list of said products, allowing the user to view the price history of any product in a page. Our extensions will still avoid doing anything on HTTPS pages, to ensure your privacy and browser security are maintained. 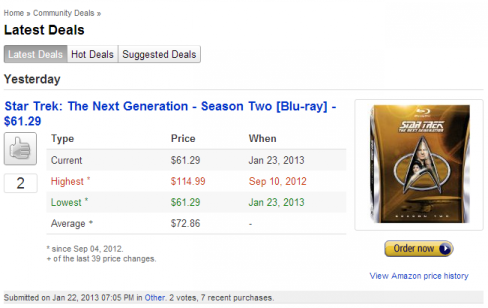 To try this new feature, visit any retailer page, like Amazon’s homepage, and click the Camel icon. 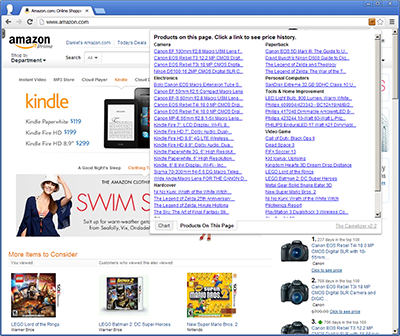 You will be shown the “other products” tab which lists all of the products found in the page. Clicking a product link will display the familiar price history chart. And a “product page” link will appear inside The Camelizer’s window next to the tabs, linking you to the product’s Amazon page. We introduced chart options – such as price type, date range, etc – in The Camelizer v2.0. In this release, we’ve enhanced them a bit. First of all, your chart options are now saved. This means the price types and date range you choose will stay the same between uses of the extension. This is useful for people who only care about used products and/or recent price changes; they no longer have to change their settings every time they use The Camelizer. As seen in the screenshot below, we’ve also made the date range options a bit smarter by disabling those options which fall outside our available data. January 23, 2013 at 12:13 PM. After a month or so of beta testing, we’ve just launched a new section of our site called Community Deals. Here are the details on the new features, and some links to help you get started. Community Deals provides a way for Camel users to discover and vote on products which they think are good deals. The products people submit to Community Deals are listed by day, with the highest-ranked products at the top of the list. Our hope is that the most interesting deals float to the top of the list, making Community Deals a constantly evolving list of deals that will be useful and interesting to participate in and browse. Adding a deal to the list is easy. If a product is eligible – it has to be in stock and sold directly by Amazon, and the price needs to be within 5% of our lowest recorded price for the product – just click the thumbs up icon at the top of the product page and the product will appear in the Suggested Deals list. Once a product is in that list, other users can vote on it. If it receives enough votes, it will appear in the Latest Deals and/or Hot Deals list. The former is a list of deals that have a minimum score, and the latter is a list of the best deals in our system. We have a lot of ideas for Community Deals. First of all, we want to make it easier to submit products, and will be adding the thumbs up button in various places around the site; anywhere we think there’s a good deal, we’ll show the thumb. Depending on how you use it, we may also make Suggested Deals a list which is automatically populated and provides a list of potential deals for users to up-vote. We plan to implement these and other changes over the next few weeks / months, so expect lots of changes in the near future! And if you’ve got any suggestions or bug reports, please contact us! We love hearing from our users. Here are some links to Community Deals in each locale we support. January 21, 2013 at 8:57 AM.